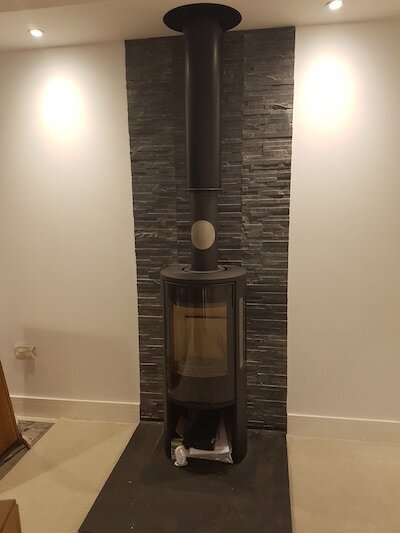 Slate hearth stones are very popular for sitting wood burner stoves on to and we offer a cut to size option if your fireplace needs that little something special to show off your new fire. We are able to offer many different shapes and sizes from a rectangular shape to a complete circular one in both 20mm and 30mm Premium Grey or Black Brazilian slate. ​As well as various shaped heaths we also offer 1 piece T shaped hearthstones up to a length of 1500mm long and a depth of 1200mm these can be quite difficult to move into place so we would recommend having in 2 individual slabs. to save either damaging it or not being able to fit into the chimney breast.